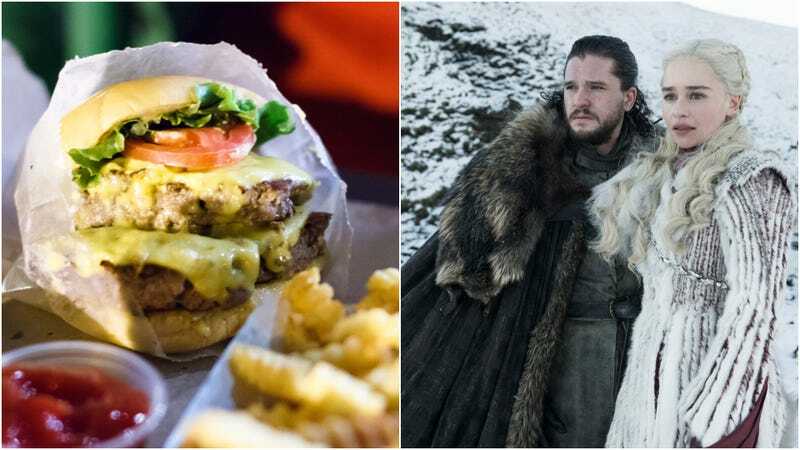 Shake Shack now joins the increasing lineup of products hooking up with a Game Of Thrones marketing tie-in, in advance of the popular HBO series’ eighth (and final) season premiere on April 14. On the heels of Oreos and Mountain Dew comes a secret GOT menu only at the Shake Shack only (dang) at the original Madison Square Park Shake Shack in Manhattan’s Flatiron District, unfortunately for Lannister followers elsewhere. The Gothamist reports, “Starting today, you can order a Dragonglass Shake and the Dracarys Burger” at that particular SS NYC branch. The Dracarys Burger (Drakaro Parkliapos) features a double Monterey Jack cheeseburger sourced from the finest head of cattle The Seven Kingdoms has to offer. Griddled by the fires of Drogon and Rhaegal, the burger is then topped with a fiery ShackSauce created from herbs and spices sourced from the conquered cities of Yunhai, Meeren and Astapor. The final touch are slabs of bacon imported from Essos—a Dothraki delicacy. Caution: may be too hot for non-Targaryens. In keeping with Shake Shack’s (Rholītso Rhakion’s) commitment to premium ingredients + thoughtful sourcing, the Dragonglass Shake (Zīrtom Perzomy Rholītsos) is a prime example of the Wall to Table movement. Custard is frozen with packed snow harvested beyond the Wall and hand churned by members of the Night’s Watch. Final prep occurs in Winterfell, where the shake is topped with shards of Dragonglass imported from the caves of Dragonstone. Please note, supplies are limited as the Wall is currently undergoing major renovations. Note to New Yorkers: The Dragonglass Shake will be available through 5/19, while the Dracarys Burger will be available through 4/21, but only while supplies last, which may not be that long. You will have to order these items in the GOT tongue of Valyrian, but Shake Shack offers a helpful graphic to walk you through it, with pronunciations of words like jaelan (“I would like a”).